Info "Grab that thing and drag it through the machine to turn it into some other thing. Things are cool." 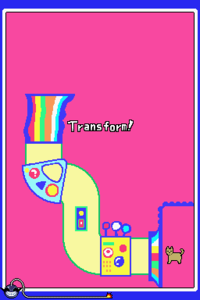 Pipe Dream is a microgame found in the Total Drag stage in WarioWare: Touched! The name of this microgame is a play on the expression "pipe dream", referring to something that is desired but unlikely to happen. The objective of the game is to drag the object through the machine tube to the top so it can transform. 1st level difficulty: The machine has a simple, thick tube. 2nd level difficulty: The machine has a thinner, longer tube. 3rd level difficulty: The machine has an even longer tube with more curves. This page was last edited on November 21, 2018, at 11:26.